My children enjoy playing board games and can be very competitive with one another. Therefore, I love the board games and Skills-Builder games for younger children available from Peaceable Kingdom because the games are designed to promote cooperative play. Instead of competing against one another, they work together towards the ultimate goal of winning the game together. 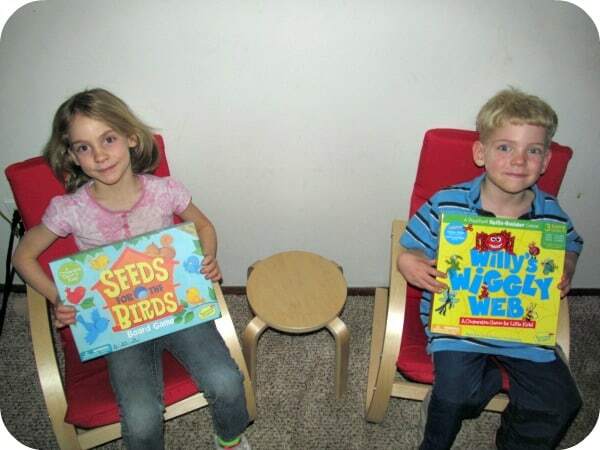 Peaceable Kingdom has a fabulous selection of award-winning cooperative games for children such as Seeds For The Birds, Willy’s Wiggly Web, Snug As A Bug In A Rug and Feed the Woozle. Any of these fun board games would be a great gift idea for the holidays and is sure to be played time and time again by the lucky recipient. Another reason that I really like Peaceable Kingdom games is that the company is eco-friendly using post-consumer recycled cardboard and soy-based inks for their high quality games. A favorite in our home is the Oppenheim Platinum Best Toy Award winner, Seeds For The Birds ($15.99) for children ages 3 and up. My five and six year old children absolutely adore this game and have played it many times. Not only is it entertaining but it is educational two as it teaches valuable early math and sorting skills. 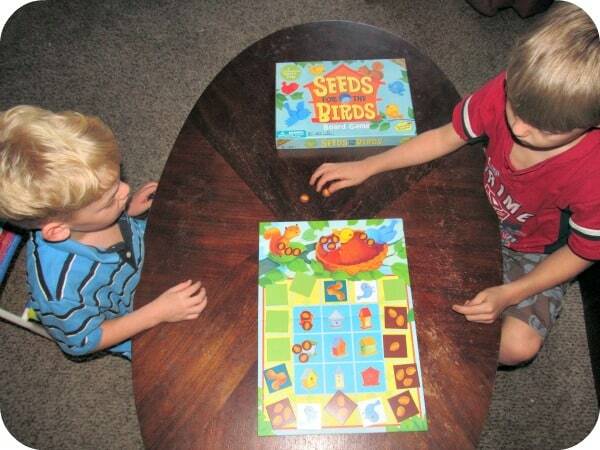 In this fun cooperative game, my children try to feed more “seeds” to the birds in the nest instead of the squirrels. If the birds have more seeds at the end of the game everyone wins. I like that this game is simple enough for younger children to learn so that they can proudly play independently without my constant supervision. I simply sit back and listen for their hoots of joy if they win or the dreaded “drats, the squirrels won” so “let’s play again”. All three of my children enjoy playing the fun Willy’s Wiggly Web Pre-School Skills-Builder Game designed for little ones ages 3-6. This cooperative skills game teaches scissors skills and help children learn left and right among other pre-school skills. My five year old couldn’t stop giggling as he and his older brother tried to cut all the little bugs free before Willy the Spider falls out of his web. There are 50 paper webs for lots of game play and I loved watching my two sons working together (instead of fighting/competing) as they rescued the bugs. 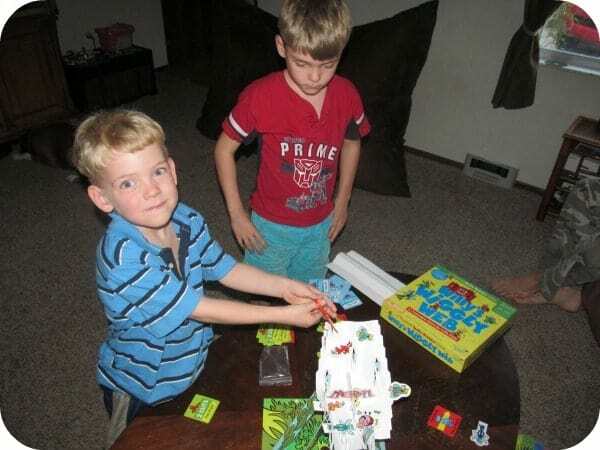 There are three games levels to keep game play fun and interesting so kids are sure to ask to play over and over again. Willy’s Wiggly Web is available for purchase for only $19.99! If you are looking for a wonderful gift idea for younger children (that don’t need batteries) then I highly recommend the cooperative play games from Peaceable Kingdom. You are invited to visit the website to learn more about all of the games available and getting purchasing information for your favorites! That is the same problem we have with our five year old son and it was very frustrating. These cooperative games make a huge difference…games are actually fun! Competition is good, but over emphasized in today’s society. We need more opportunities to learn and practice cooperation. These games are a good start. Nice to play a game where everyone wins. Interesting product. I have a highly competitive 6-year-old and a very gentle 4-year-old – I think these games would actually work for them to actually play together! I love this idea! I have one out of my four children that is such a sore loser when it comes to games. These would be character building for her. I’ve never heard of this company before. Thank you for sharing!